Airlines, airports and air traffic control are attractive employers for hundreds of thousands of men and women. They provide employment in Germany – far beyond the borders of our own industry. Aviation creates a diverse working environment with various professions. Both new entrants to the job market and people changing careers from other sectors find a wide range of employment opportunities in airlines, airports and air traffic control. A multitude of aviation professions regularly rank among the most popular professions in surveys of young people about their career aspirations: even as children, many already dream of careers as pilots or air traffic controllers. In terms of numbers, aviation is also an important factor in German industry: around 330,000 men and women work directly for airlines, the civil aviation industry, airports and air traffic control. In addition, there are around 353,000 jobs at companies that depend on orders from the aviation industry, for example in the construction and food industries. The consumer spending of the directly and indirectly employed, for example on food and clothing, lead to another 146,000 jobs. Aviation thus secures – directly, indirectly and inductively – the employment of more than 800,000 people in Germany. How much added value and how many jobs are created in the German aviation industry itself depends largely on how many aircraft and crews are based at German airports. German airlines have several hundred aircraft based at German airports. This has the following implications: in terms of turnover, basing a short-haul aircraft in Germany can be compared to the establishment of a medium-sized company. In terms of turnover, a long-haul aircraft is equivalent to a large-scale enterprise. The employment effects are also enormous. 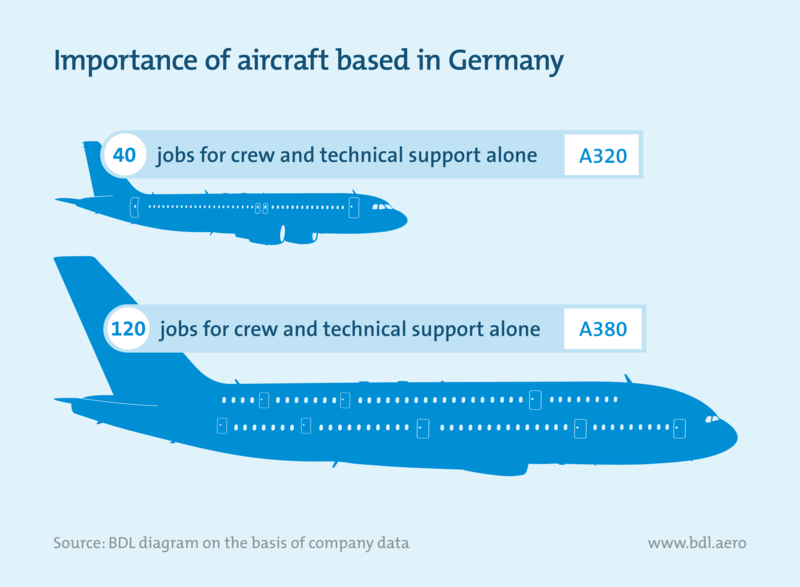 Every long-haul aircraft based in Germany, such as an A380, secures around 120 jobs for the airline’s mobile staff and technical support alone. In addition, there is a three-digit number of jobs in administration and with the system partners. A short- and medium-haul aircraft based in Germany, such as an A320, secures around 40 jobs for pilots, flight attendants and technical support, as well as many new jobs in administration. So one could say the German airlines alone currently operate about 150 large-scale enterprises and more than 500 medium-sized companies at German airports – with the corresponding employment and value-addition gains for the entire business location. In addition, there are aircraft based at German airports by foreign airlines that employ staff at those airports. 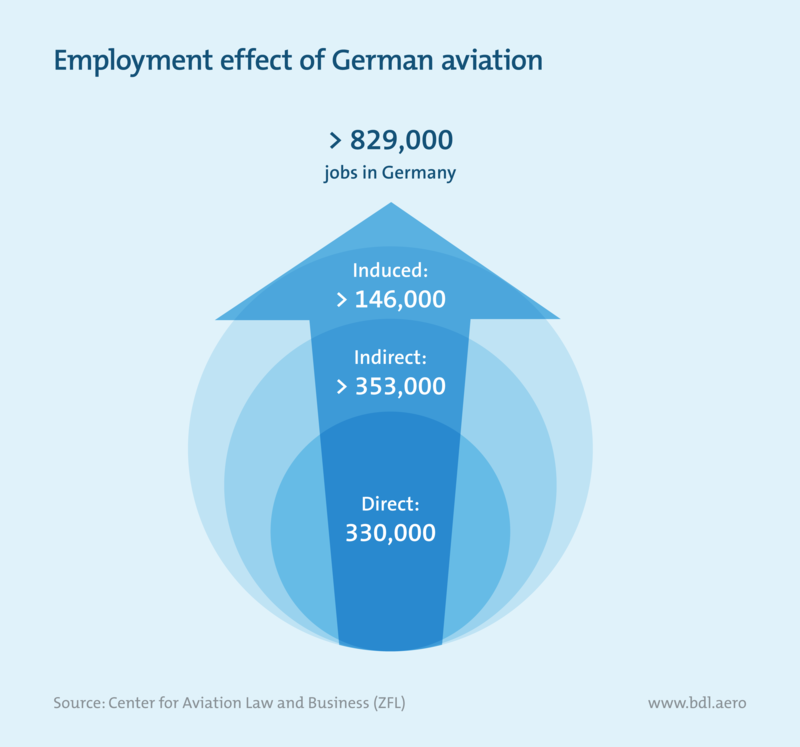 However, the employment effect of the German aviation industry goes far beyond the impacts described above. In its role as a mobility service provider for people and companies, air transport provides millions of secure jobs throughout the German economy: on the one hand, the tourism industry is largely dependent on air traffic, and on the other hand, the export-oriented German industry needs transport by air freight, for which in many cases there are no alternatives.